New York: Nan Talese / Doubleday, 2003. New York: Talese/Doubleday, 2003. First edition. 8vo. Cloth. 304 p. Black and white photographs. Signed by author on title page. The fourth volume of the acclaimed Hinges of History series. 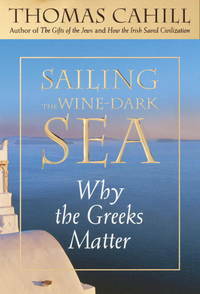 Cahill brings his characteristic wit and style to a fascinating tour of ancient Greece. Gift inscription. Price clipped. Fine in near fine dustjacket in mylar cover.. Signed by Author. First Edition. Cloth. Fine/Near Fine. 8vo - over 7¾" - 9¾" tall.